The last match of the season and that against a team from the Scot Lands. The Ship Inn from Elie are a very friendly team – they only play friendlies – and their home ground is on the beach – so they can only play when the tide is out. Once it is out they roll the sand and can get in a 30 innings per side match in the six hours available. They also have their own playing rules which is that every player except the keeper has to bowl two overs before anyone can bowl a third. They also play that a batsman must retire once he scores 50. They had 14 players in their party so it turned out to be a scorer’s nightmare as they used thirteen bowlers. 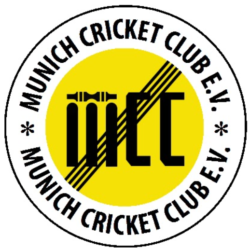 Most of them were staying in the Euro Youth Hotel where club member Andy Mayston had kindly lapsed his Oktoberfest rule not to take bookings for groups as they were MCC guests. On arrival at the hotel one of the Elie squad was greeted with “we don`t see many wearing cravats in here”. Captain for the day Clare cheated quite brazenly to win the toss and chose to bat, opening with Parlour and Veser. Despite swapping out the bowlers regularly the score ambled along in test match fashion and after 10 overs – equals six bowlers – MCC were 35 for 0. The pace was upped somewhat and in the 20th over Parlour passed his fifty so MCC were 127 for 1. In came Konchada, desperate not to get a duck and scored only 1 from the first 12 balls faced. Veser meanwhile had passed 50 and so with 2 down MCC were 130 and in came Arunachalam. He and Konchada now went over to very aggressive batting and put on 68 for the third wicket, before Konchada was run out, much to the joy of Kantor who had been patrolling the boundary in full kit hoping for a last knock of the season. There were only two balls left and Arunachalam was facing but, joy of joy, it was a no-ball and they ran so Kantor was able to get a much celebrated single. 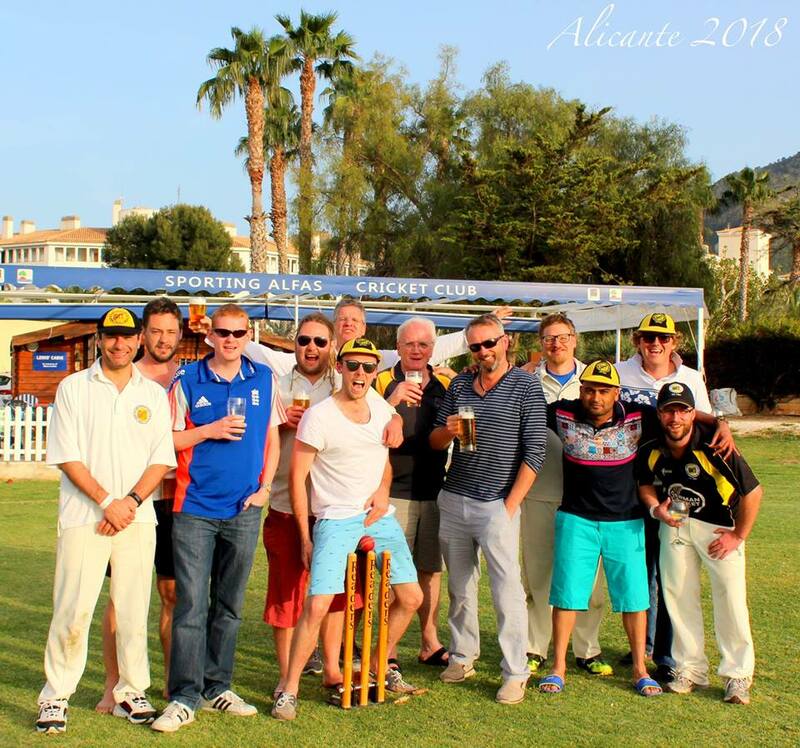 After teas provided by Kantor and Sestan, MCC opened the bowling with Sestan and Kantor – take note members, bring the teas and you get to open the bowling. Captain Clare had decided to bowl those first who hadn`t had a bat so didn`t stick to the two overs for everyone first rule. The openers bowled only three wides in their nine overs and took one wicket, a splendid catch by Konchada off Kantor and Elie were 35 for 1. Kulanagayam and Scott took over the attack, both bowled tightly and took 2 for 5 and 2 for 10 respectively and after 15 overs Elie were 50 for 5. Gaikwad took two in his first over to make it 52 for 7. The eighth wicket put on a soixante-neuf but was broken by Arunachalam in the 29th over. Konchada came on for the final over and went for 4 w . . . w so Elie were all out on the last possible ball of the innings for 124. Helmut had stocked up with three crates of cool fresh which didn`t last long – thirsty fellows these Scots – so we retired to the Chinese Tower for several Mass and then, around 9pm, to be soaked when Daniel really let it down once again. This was the long awaited tour of the Blackheath 5’s after a very wet and rainy Friday and some showers into Saturday morning. Nevertheless the selection committee did wonders to pick an XI from the 20 members available and even remembered to tell off two for teas. One of them, O’Meagher brought some, the other, Bhamare thought it meant he had to pay 30 euros for teas in order to be able to play. Considering the problems we have with our Indian players and teas, I imagine providing teas for the team and opposition is simply not done in India. The problem was solved by sending the Gor on a bicycle to the nearby Tengelmans to get a second lot. Captain Sarma lost the toss and MCC were asked to field, opening with Lancashire’s best Dom Gill and Garner. Garner took the first wicket in his third over, caught Gaikwad – another Indian who can catch – with the score on 19. Some 16 runs later Maxi Hoeck of Tegernsee who had set up the tour was run out by Clare who managed to finger the ball on to the stumps after it had been hit straight back to him. He later bowled Heidi – not a Swiss Mädchen but the nickname for an Aussie called Fleiss – to enter the 25 wicket club. Wickets fell regularly with no-one taking more than a couple as most were only allowed three overs or one wicket by the captain. There was a lot of embarrassingly aggressive appealing for LBW but all emanating from the Blackheath side who had some kind of competition going to get their own players given out. They were pretty well oiled having spent two nights in Munich already and many of them went straight to the cool fresh in the changing room before the game. “I will only umpire if I can smoke and drink” said one. They were joined shortly afterwards by the Tasmanian Brummie who turned up to watch. The Blackadders including Baldrick were all out for 75 in 27.3 overs but considered it a score to defend as they have won games fielding second defending lower scores. This was the first time any of them had ever played on anything other than a grass wicket so they were somewhat bemused by the lack of bounce on a Flicx laid on a soggy underground. As rain clouds were looming it was decided to play the second innings and take teas after the game was over. O’Meagher and Mitchell opened and hit the first boundaries of the match, a four and a six. Mitchells six was a sight to behold and was much admired by the opposition afterwards. O’Meagher went for 10, LBW, with the score on 10 and was replaced by Sarma. He and Mitchell put on 23 before Daniel let it down and the game was abandoned. The plentiful teas, washed down with three crates made for an enjoyable post match gathering and at 7 pm all retired to Fräulein Grüneis’s for a couple more and then onwards for a Ruby Murray where the cook had learned once again to make spicy mean spicy. Then it was time to leave the guests on another crawl around Munich to be home in time for “last night of the proms”. Gill, DNB, 4 overs, 0 mdns, 11 runs, 0 wkts. With the teams sorted out – TCC actually only brought three players as JET had an argument with his motorbike in the morning and broke a finger – captain for the day Blades duly lost the toss, yet again, and MCC were asked to bowl. Hoeck and Arunachalam opened the batting to face Sestan and Konchada who both bowled well taking one wicket for 36 in eight overs between them. Next on were Blades and Penjuri who took three wickets for 30 in their eight overs, one of them to a superb running catch in the deep from Konchada to remove Gattinger. It was no consolation to him that on any other ground in Munich that hit would have been a six. The third bowling pair was Miller – always good for a wicket – and Alagh who took two wickets for 34 in their six overs and finally on came non-bowler Parlour who bowled very tightly with the slightly more expensive Algar and they took two wickets for 39 in their eight overs, Parlour getting Arunachalam, the highest scorer of the match for 47 with a stunning caught and bowled. TCC-CCB United finished on 141 for eight down in their thirty overs, 65 of the runs scored by the MCC ringers – this increases to 95 if we add the wides. After teas which included some tasty home-made sausage rolls provided by Algar, MCC opened with Palfrey and O`Connor to face Govendar and Hoeck. Palfrey went caught by Arunachalam after facing three balls and was replaced by non-bowler Parlour, hand still bruised and smarting from the c&b earlier. O`Connor decided the cool fresh was calling and departed for one after facing 9 balls actually admitting the single should have been a bye but was willing to accept it as a run. With Veser and Parlour a good third wicket partnership of 55 blossomed until Veser went for 21, caught by Hoeck off Habib, one of the CCB players. Parlour went for 30 two overs later bowled by Gaikwad. Konchada and Algar put on a decent 28 for the fifth wicket until Konchada was rather unfortunately run out for 11. Alagh came and went quickly but succeeded in lowering the danger of taking the lead in the duck race. Miller had a golden one and MCC were now 113 for seven down in the 28th over. Out strode Sestan, eyes flashing and successfully preventing a hat-trick for Chakry. He also succeeded in passing the strike to Algar who was scoring at a rate of two a ball so we were in with a chance until Algar was rather comically run-out, he and Sestan doing a little two-step shuffle in the middle of the pitch rather than run around each other. Penjuri blocked the next three balls of Arunachalam’s over and Sestan somehow avoided hitting Gattinger`s only ball of the match and went for a duck. MCC were all out for 118 as Blades decided not to bat because the opposition had only nine batters too. It has been a very enjoyable match and 15 MCC players had been able to get a game so many thanks to the organisers for some great work. Penjuri, 0*, 4 overs, 0 mdns, 15 runs, 1 wkt. Another friendly at the glorious Hirschanger against CCB almost didn`t happen as on Thursday they advised they had only 7 players and would have to cancel if we did not help them out. This led to groveling appeals to Tegernsee during Friday and coercion of three new MCC players at the Friday nets. On Saturday then CCB, now referred to as CCB United, arrived with eight plus Krishna from Tegernsee and we gave them Pankaj Saini, Badrinath SN and Chris Lobo making them 12 in total. MCC had 12 too with Sestan known to be available only for the first innings. Nirmal Konchada arrived late and was promptly assigned to the United team making it 13 against 12 with all batting but only 11 fielders at any one time. Untied won the toss and chose to bat, their openers Krishna and Lobo facing the wrath of Sestan and Raubenheimer. Raubenheimer bowled his new club mate Lobo in his second over and Sestan, who had bowled two very tight opening overs went haywire in his third with no balls, wides, longhop boundaries etc. but somehow managed to bowl Krishna. New member Badri was bowled by old member Miller – always good for a wicket is Scott- after doggedly defending 29 balls. The third new member, Pankaj was superbly run out by Algar/Clare after 26 balls. In all MCC used 10 bowlers to take the 12 United wickets for 151 in the 32nd over, including 36 wides. After teas provided by Arunachalam and cakes by Franz Spiess MCC opened with Weston and keeper Parameswaran and they put on 32 before Parameswaran went LBW for 5, followed shortly after by Weston. Aranachalam and Alagh added only one to the score before Alagh was run out without facing a ball – actually the keeper broke the wicket before gathering the ball but the umpire was unsighted so bad luck Manev. Clare played his famous shot for six over square but went for 8 after facing five balls. Algar and Nielsen both looked good but didn`t score many and MCC were 90 for 7 down in the 19th over. Penjuri and Blades put on 27 for the eighth wicket, Penjuri demonstrating his crab-like, Chanderpaul defence admirably. Blades and Raubenheimer stayed together for 4 overs with Raubenheimer finishing 1 not out. Great defense there Michael but think about upping the scoring rate. Miller was the last wicket to fall to a caught and bowled from Konchada, clearly extracting revenge for being pressed into the United team. Miller, 1. caught, 3 overs, 0 mdns, 23 runs, 2 wkts. MCC, 124 for 10, lost to CCB United, 151 for 12 by 27 runs. Thanks to those who answered our call for help, especially the three new members who turned out for the opposition and made it a very enjoyable match in perfect weather.